Tebrikler - 9. 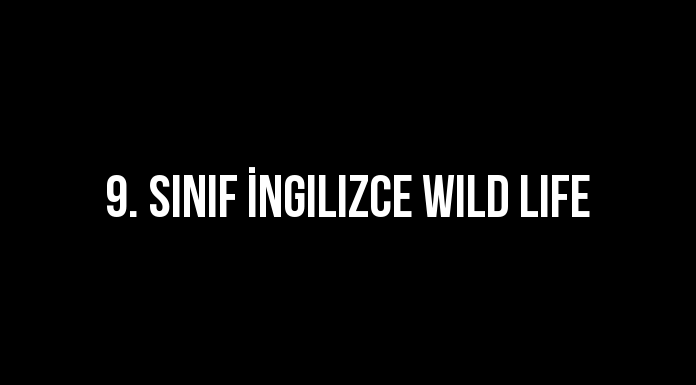 Sınıf İngilizce Wild Life adlı sınavı başarıyla tamamladınız. "1-6. sorularda, cümlede boş bırakılan yere uygun düşen sözcük ya da ifadeyi bulunuz." Thomas : - - - - ? Mike : We usually have eggs, cheese and tea. Betty : - - - - ? Laura : We usually meet friends and we sometimes have our dinner together. In the evenings, we usually go to the cinema. Daisy : - - - - ? Patricia : It is a herbivore and feeds mainly on leaves and roots. Michael : - - - - ? Donald : I brush my teeth twice a day. Karen : Have you finished your homework, yet? Sandra : Yes, of course. - - - - . The disaster told in the paragraph is - - - - . "7 - 8. soruları aşağıdaki tabloya göre cevaplayınız." 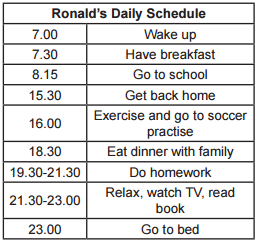 Ronald eats dinner with his family before he - - - - . Ronald - - - - . "9-10.soruları aşağıdaki parçaya göre cevaplayınız." Hello. My name is Joseph and I am twenty three years old. I usually get up at half past six and then I have a shower. I have breakfast at seven and at twenty past seven I go to the office by my car. My job starts at nine o’clock. At half past one, I have lunch in the office canteen. I go home at ten past five. When I arrive home, I take my dog to the park for a walk. Next, I always meet with friends for dinner in a vegetarian restaurant as I always eat vegetables. After that, I watch TV in the living room. Finally, I brush my teeth and at about ten o’clock, I go to bed. Joseph never - - - - . Joseph - - - - . "11-12. soruları aşağıdaki parçaya göre cevaplayınız." The Siberian Tiger has yellow and white fur with black stripes. It weights around 250 kg and its average length is around 190 cm. The tail is about 99 cm. They live in Russian Federation and there are only around 350 tigers in the region of Siberia. They have a thick fur of 40 mm. It helps them keep warm in winter. Adam: - - - - ? Brian : It is around 190 cm. The Siberian Tiger’s - - - - .